Both The Zealots AND George Trouble are releasing albums in spring 2019! 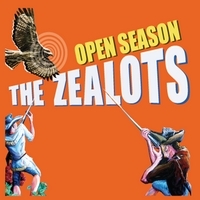 “The dozen tracks that make up The Zealots’ new album, Open Season are underscored throughout by energetic power-pop riffs, punchy percussion that edges up against hyperactivity, and boisterous lyrics. “The Zealots formed in New York in the ‘80s and have seen a number of iterations. Now based in Asheville, the lineup includes George Terry on lead vocals and guitar, lead guitar/multi-instrumentalist Aaron Price (who also produced Open Season), Christian Ferri on bass and poet-drummer Caleb Beissert.